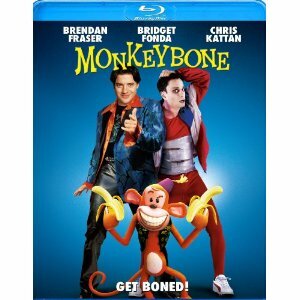 WorldMovieStore - Monkeybone Sinopsis. Brendan Fraser plays the best-looking cartoonist you'll ever see in Monkeybone. Stu (Fraser) has created an animated character named Monkeybone, who sprang from his repressed sexual anxieties. Naturally, Monkeybone himself is there, and he and Stu quickly start fighting like cats and dogs. Sound complicated? Fraser is excellent, and the strong supporting cast includes Giancarlo Esposito (Do the Right Thing), Rose McGowan (Scream), Dave Foley (Brain Candy), and Saturday Night Live's Chris Kattan as a gymnast with a broken neck who... well, it's a bit complicated to explain. --Bret Fetzer. Read More Sinopsis. 0 Response to "Blu-ray Release Monkeybone"